Drivers turn to all-wheel drive SUVs for peace of mind on the road — or off. Enhanced traction and superior handling make all-wheel drive vehicles the best option for any type of weather and any type of terrain around Corpus Christi or Kingsville. 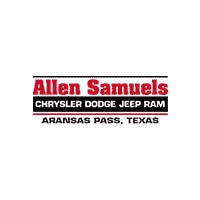 Allen Samuels CDJR Aransas Pass offers an extensive selection of pre-owned all-wheel-drive SUVs for sale in Aransas Pass, TX; find yours below. Thanks to their large, heavy frames, SUVs dominate as one of the safest types of vehicles on the road. Factor in all-wheel drive and there is almost nothing these vehicles can’t handle. If you regularly encounter inclement weather or less than ideal driving conditions (uneven terrain, mud), all-wheel drive can help give you the security you need to navigate with confidence. Allen Samuels CDJR Aransas Pass is proud to offer a wide selection of all-wheel drive SUVs in Aransas Pass, including used and Certified Pre-Owned models. When you’re ready to experience the feeling of additional traction and handling for yourself, schedule a test drive with our friendly sales team today!